Looking for a good eGPU that’s compatible with your MacBook Pro or Windows laptop? Here are three we’d recommend. So your Windows or Mac laptop doesn’t have a graphics card and you’re looking for additional performance for games or rendering. What eGPU would be a good and compatible option? Admittedly, compatibility is still a bit tricky for Mac owners at this point in time; however even Pascal graphics cards work at this time. If your aim is to game, installing Bootcamp to use Windows while PC gaming will get you the best performance for your Mac. There’s a lot of good reasons for doing this as you can take your Mac or Windows Laptop, use a current graphics card, and keep updating it in the future without having to purchase a new laptop. If your aim is to game, installing Bootcamp to use Windows while PC gaming will get you the best performance for your Mac. There’s a lot of good reasons for doing this as you can take your Mac or Windows Laptop, use a current graphics card, and keep updating it in the future without having to purchase a new laptop. Before we get into which eGPUs we think are best, any MacBook Pro that has Thunderbolt should technically be able to use an external graphics card. That being said, Apple doesn’t offer official support for eGPUs so it’s important you understand what you’re getting into. The first thing to understand when choosing an eGPU is that Thunderbolt is both backward and forwards compatible (an adapter is required for this functionality). As such, we feel that getting an eGPU with Thunderbolt 3 is ideal as it will work with your current MacBook Pro and any new ones with Thunderbolt you purchase in the future. If you have an older MacBook simply purchase the adapter. Newer MacBooks don’t need one. The PCIe speed difference is significant with speeds of 10Gbps on Thunderbolt and 32Gbps on Thunderbolt 3. So, it’s a good idea to stay current. 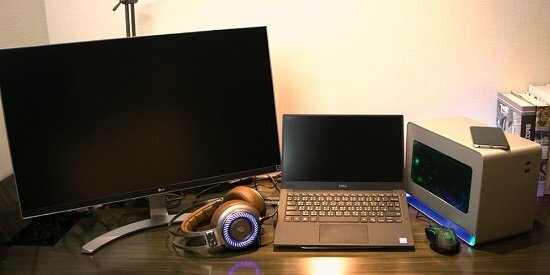 If you’re new to setting up your eGPU, I highly recommend this guide for a walk through. There’s also a forum for questions that you might have. 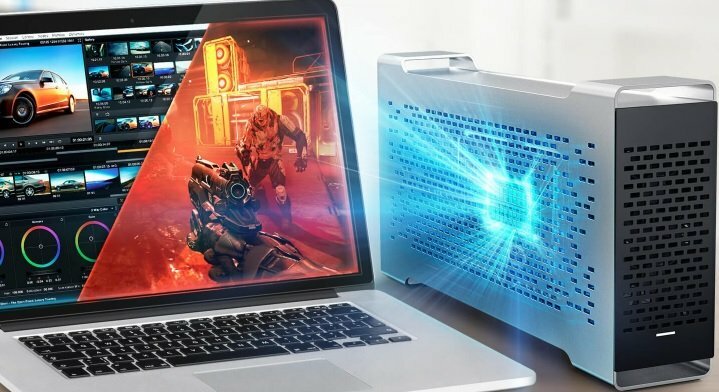 Capable of housing a full-sized GPU the Akitio Node is probably the best affordable option for Mac or Windows laptop users that want additional graphical power for games or rendering. 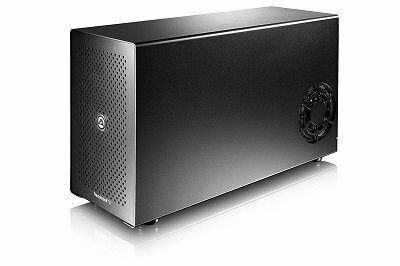 It comes with Thunderbolt 3 and has a 400W SFX power supply for powering your graphics card. If you plan on carrying the Akitio Node around it weights in at around 13.6 pounds with dimensions of 22 x 10 x 15 inches. So, it’s fairly compact and easy to move around. The Akitio also has a handle on the back for taking it with you on a business trip or to a LAN party. The Akitio comes Windows compatible out of the box. However, if you plan on using this for your MacBook Pro you may need to update to the latest version of Firmware (some newer models include this). If you haven’t done so, you may also need to update your Thunderbolt 3 drivers before you can update the Firmware. If you’re unsure of how to do this, it’s not that bad! The video below can walk you through it. While $300 isn’t cheap, it’s certainly cheaper than other Thunderbolt 3 options out there right now. It has everything you need and nothing you don’t with speeds of up to 40 Gbps. 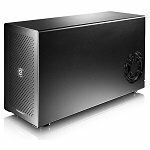 So, if you want a good eGPU that is a fair price is well, this is what we recommend. Although it’s a bit more expensive, the Bizon Box has a lot going for it. In terms of the design, it’s top notch. The case is unique and a solid piece of aircraft-grade aluminum. Cooling with the Bizon is a breeze as well with natural cuts made into the enclosure that forces heat out and keeps the cooler air in. For portability, the Bizon Box is fairly small at around 14.17 inches x 3.5 inches x 8.07. The case weight, without any of the extras, is around 4.4 pounds. With the included power supply and carton, it’s around 8.8 pounds. This is significantly lighter than the Akitio model. Speaking of the power supply, it comes with a 200-watt option but you can also get a 400W proprietary option as well. In terms of the graphics card that can be supported by the Bizon Box, all options are on the table. This includes full height and double width graphics cards. 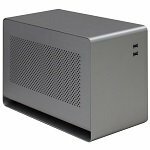 Overall, the Bizon Box 3 is expensive, but looks fantastic and performs admirably with Thunderbolt 3 and data transfer up to 40 Gbps. Still, we’d recommend the Akitio at around half the price for most consumers. 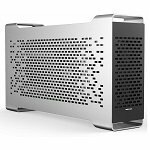 The Venus from Mantiz is a new eGPU that’s affordable and has an aluminum design. It looks great next to any premium laptop. A lot of people haven’t heard of the Mantiz Venus, but it’s a good eGPU option that has a lot going for it. It comes with a gold certified PSU and is listed as plug and play using USB C. Dimensions for this new case are 165 mm x 340mm x 216mm. The board is Thunderbolt 3-enabled and has a single 16x PCIe slot. It also supports USB power delivery with up to 87W to your MacBook Pro. 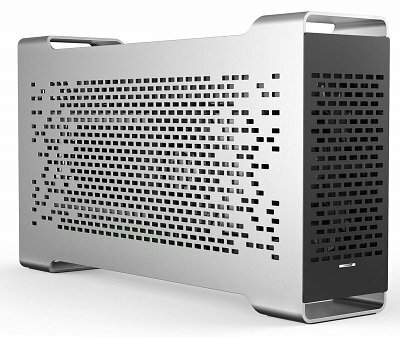 Like the Bizon, this case is aluminum with a mesh air design and looks great next to a high-end laptop or MacBook Pro. The best part about this case is the ease of use. No scripts needed. It’s a good solution and one we definitely recommend. Overall, we think eGPUs are a good idea if you prefer to use a laptop over a desktop and want a graphics card that you can update regularly. Clearly, they aren’t for everyone. However, if you know what you’re getting they can be a good value when compared to constantly updating your laptop or buying a new gaming one. Again, your best bet is to install Windows Bootcamp if you’re wanting to game. For now, there’s no way around this. If you’re looking at what graphics card would be best to go with your laptop, that’s another discussion. However, NVIDIA’s pascal-based graphics cards do work with this on Mac.